I have covered the Singapore Formula 1 event for 2 years already.Â My first coverage was the first ever Night Race in the history of Formula 1 and I was there to witness!Â Second was interesting for me because I had access to the pit stop! Lucky!! !Â Also, I bought a DSLR just for this purposeâ€¦ I bought a Nikon D40 kit and I bought another 70-300mm G Nikkor lens when I went to Hong Kong and it was just for Formula 1! Yesâ€¦ those shots are mineâ€¦ ALL RIGHTS RESERVED! To goâ€¦ or not to go? This year, itâ€™s another interesting seasonâ€¦ a very interesting one indeed.Â We wonâ€™t be seeing Kimi Raikkonen race though as he has dropped out of Formula 1 and joined the World Rally.Â Although, whatâ€™s special about this season is the comeback of the super F1 legend Michael Schumacher!Â I have not seen him in person yet so this would be the only push Iâ€™d have to watch the Singapore GP again this year! Unless of course there would be sponsors for my trip and if I get a media pass for this event then I would definitely love to cover again.Â The only reason why I am thinking of not going is financial constraints huhu. Anywayâ€¦ Itâ€™s a new season and I have received another special email to book my ticket earlier than the â€œearly birdâ€ tickets.Â Itâ€™s the same price as the early bird ticket really but the advantage is, I could get good seats.Â Last year (2009) I was able to get a very good seat at the Bay Grandstand area.Â I did not get the best seat but let me tell you about the best seat for grand stand later. To those who received the special e-mail, you may book now!!! So hurry and get good seats before they open the ticketing to the public!Â To those who have not received the email but would really want to buy NOW, then drop me an e-mail through my contact page and I will tell you the password which will only work until March 1! I have access to the ticketing now and I viewed it of course.Â For those who are planning their trip to Singapore now to watch the F1, good for you!!! Itâ€™s the way to go to get cheaper tickets and trip! 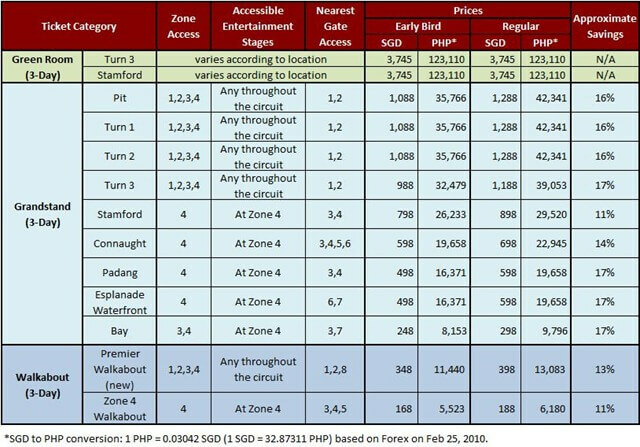 Below is the chart of the prices from the Singapore GP Ticketing.Â Notice that there is a new ticket available â€œPremiere Walkaboutâ€ which is very interesting because it will give you access to all Zones at a lower price.Â Notice that I also converted the SGD prices into PHP for my Filipino friendsâ€¦ you need not convert. 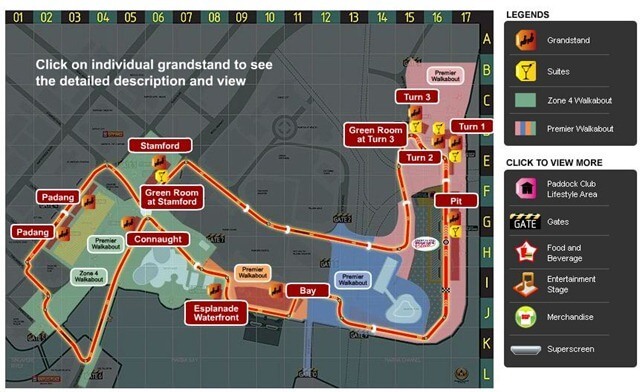 Hereâ€™s the new map.Â Last year I compared the 2008 and 2009 Singapore GP map and I was frustrated that the walk-about area was changed on 2009 and had limited access.Â This made me decide to purchase a seat at the Bay Grandstand instead.Â There is not much difference between the 2010 and 2009 Singapore F1 map on the other hand.Â All is basically the same (the zones and gates) except for the Premiere Walkabout tickets that would give access to all zones at a cheaper price. Want to watch the Singapore GP 2010 on a budget? Please find some of my posts before on how I watched the Singapore GP 2008 with a PHP 20,000 budget (4 days, 4 nights and Sunday walk-about ticket) and the Singapore GP 2009 with a PHP 30,000 budget (7 days, 7 nights and Bay Grandstand ticket). I have been covering the Singapore Grand Prix for 2 years straight and if my financials would allow, I would go again this year.Â Unfortunately, Iâ€™m running out of moolah and I could not watch this very exciting sporting event again which is very close to my heart, until I get sponsors (tickets, accomodations, airfare, media passes, Digital SLRs and video cams).Â If you are interested in sponsoring flaircandy.com, kindly contact me at my contact page or email me directly at [email protected] .Â I definitely promote my sponsors well on my blog and, depending on the case, I put links and a premiere slot on my sidebar. I would love to sponsor!!! They’re looking for volunteers months ago ah, yun nga lang not sure if covered yung plane tickets..
Should I go for the bay grandstand (which rows/areas are best, and if you have dos and donts please)? Should I get the premier walkabout (would i need a kangaroo TV or are there nice locations near a screen)? Or just get the regular walkabout AND a kangaroo TV? Any comments you can share will be greatly appreciated. Thanks!!! 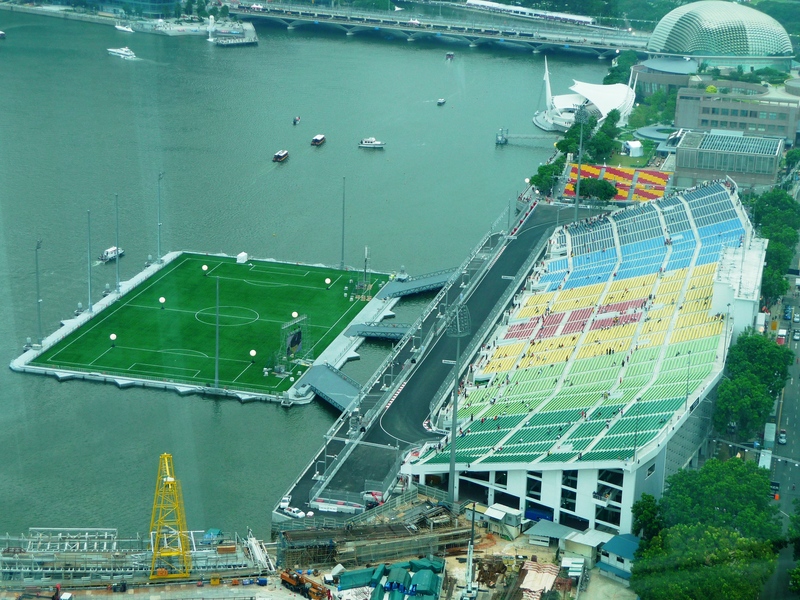 Hi Hannah, this is good info, I just booked my ‘budget’ trip to SG to watch the race (and tour of course! ), and oh, just bought the zone 4 tix. Additional thing that blows is that they don’t offer the single day pass, although there’s news that they will release 5000 raceday tix on a later date when the performances are announced. also where’s the best spot in zone4? yeah… I’m just saddened that they did not release single day tickets anymore unlike the race last 2008 and 2009.